Michael Smith of Kitchen Concepts Plus has been named the 2006-2007 Hawaii regional winner of a national kitchen design contest held by Sub-Zero/Wolf. After incorporating an Asian-themed cooking and entertaining area into the high-end kitchen of a Waialae-Kahala couple, Smith was rewarded by the kitchen appliance company with a $500 cash prize and a trip for two to the Hyatt Regency Resort and Spa in Scottsdale, Ariz., where he will compete along with other regional winners for a shot at $20,000. A tote bag is made from the caps of soda bottles. 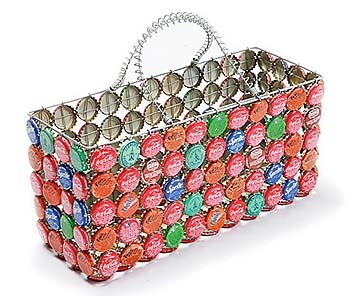 While the contents of soda bottles might not be all that healthful, you can at least take a step toward living green with the tote bag made from old recycled Coke, Fanta and Sprite bottle caps. Straddling the line between pop art and trendy kitsch, the bag constructed entirely of metal could be the perfect accessory for picking up litter and other trash -- especially with Earth Day coming up on April 22 -- or at least the magazines on the floor of your living room. Available at Barnes & Noble, $29.95. Dancers' bodies are treated as puzzle pieces in Kumu Kahua Theatre's "we take," choreographed and directed by Abel Coelho. The production, opening Sunday at 8 p.m., feature dancers in asymmetrical or animal-like poses who move to unpredictable rhythms, reflecting Coelho's background in gymnastics and butoh. "We take" continues Monday and April 6, 7 and 9. Admission is $5. Call 536-4441. Fashionista's Market is offering clothes, bags and accessories, from 10 a.m. to 2 p.m. Sunday at the Manoa Marketplace courtyard and upstairs outside The Wedding Café, during a sales event to benefit Domestic Violence Action Center's Teen Program. Twenty percent of sales of all clothing, bags, accessories, Luxe Links and food orders will be donated to the organization that helps educate teens about the dangers of abusive relationships. In addition, 20 percent of all food and retail sales at The Wedding Café's Ward Warehouse boutique will also be going to DVAC. Admission is free. Call the café, 988-1005. Hawaiian South Shore will present a fashion show, "3 Senses" from 5:30 to 8:30 p.m. tomorrow in the store's parking lot at 320 Ward Ave. The show, promoting local designers and artists, will feature clothing, jewelry, entertainment by Lost at Sea, and the screening of "New Emissions of Light and Sound. Featured designers and brands are Awdisy Intervention, Drone, HE>i, Cassandra Rull, Michele Leong, Trina Orimoto and Imperial Motion. Admission is free. Call 597-9055. Auditions for the Bachelor of Fine Arts degree program in dance will be held at 5:30 p.m. April 14 at the University of Hawaii at Manoa. UH dance faculty will lead participants in a ballet barre, modern dance combinations and a group improvisation. Auditions will be held in the Temporary Dance Building, on the lower campus, across from the tennis courts. Information about the undergraduate dance degree program will also be provided. Call 956-3264. » Workers and owners rally to "save the Ilikai"